Reliable — Internal battery back-up maintains correct time. Accurate — Automatic Daylight Saving Time adjustments mean you never need to reset the clock. Versatile — With selectable print formats and support for both weekly and bi-weekly payroll periods, the ATR120 prints time the way you want it. Convenient — Two color printing allows you to quickly see early and late punches, reducing payroll errors and processing time, and making time cards edits quick and easy. 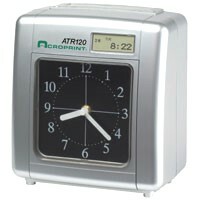 Useful — A built-in programmable buzzer notifies employees of stop and start times. Supports both weekly and bi-weekly payroll periods, and can be set to print "late in" and "early out" punches in red for easier card editing. Just insert the card in the top slot and the time clock will position the card, print the date and time, and eject the card. A built-in battery backup and automatic Daylight Saving Time adjustments help insure the clock maintains the correct time. Add the available NiCd battery pack and your employees will be able to punch in and out (up to 200 punches) even when the power is out!